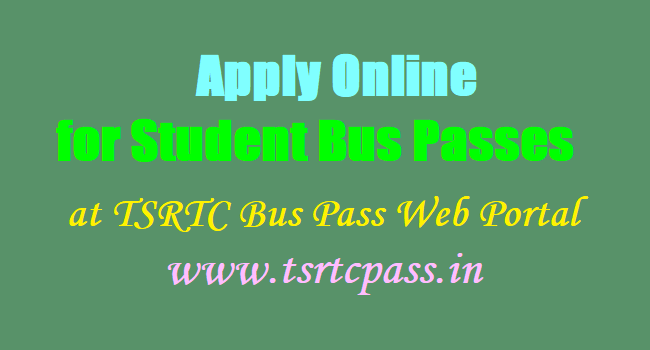 Apply Online for Student Bus Passes @ TSRTC Bus pass web portal: www.tsrtcpass.in: Apply Online for Student Bus Passes, Apply Student Bus Passes Online, District Bus Passes for students, Student Pass above SSC, Student Pass upto SSC, Online bus passes are issued from today from Pass Automatic Accountal System, TSRTC Bus Pass Student Online registration web portal: https://online.tsrtcpass.in/. TSRTC Bus Pass Web portal : www.tsrtcpass.in, Student Bus Pass Online application form for Above SSC Students, Student Bus Pass Online application form for upto SSC Students, Student Bus Pass Online application form for Students of Hyderabad and surrounding District Areas. TSRTC bus passes will be issued from across the Telangana from 18-06-2017 to students of Government and Private Educational institutions. In previous year, all the bus passes candidates filled the form and applied to the bus pass counter in the nearest Bus stand and entered the computer. From this academic year, there is no queue system. All steps have been taken to issue the bus passes through online mode @ https://online.tsrtcpass.in/.